How many times have you been forwarded an email that you thought was funny? How many times did you then re-forward that email to everyone in your contact list? That simple act is a great example of viral marketing. If you can create an item of content, whether it be video or a simple picture that’s worth a thousand words, you can spend very little money, sometimes none at all, and capture a huge audience. It doesn’t have to be anything crazy or over-complicated. Let me give you another example. 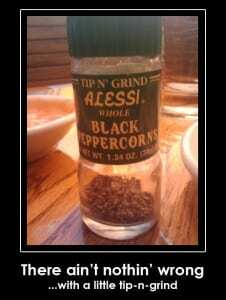 I was at dinner last night when I noticed the label on the pepper at the table. Tip N’ Grind. Now, here’s how this company could take less than 10 minutes out of one of their designer’s time to create something that will be passed around and bring free exposure for years. I present… the Tip N’ Grind inspiration sign. Now, you know very well that you will remember that. Maybe even the next time you are in the store and notice it you will purchase their brand “just because.” That is the beauty of viral marketing. Best of all, that took just 5 minutes to download the pic and photoshop the border and text to create a viral piece of material.